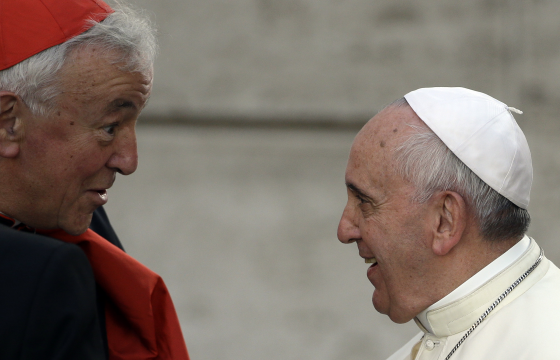 The Synod on the Family will not change Church teaching or provide a “categorical” answer to communion for divorced and remarried but instead try to find new pastoral approaches to couples in such a position, Cardinal Vincent Nichols has said. Speaking on the eve of the start of the ordinary synod, which was opened by Pope Francis yesterday, the cardinal said the Church needed to rediscover ways of expressing God’s mercy and learn from the witness of families. “There is not going to be any doctrinal change. There is not going to be a notion that indissolubility of a valid sacramental Catholic marriage as something that we can park at one side and move on,” he told The Tablet. He added that it “is no surprise” that Pope Francis established the Jubilee Year of Mercy, due to start on 8 December, as the likely context in which the conclusions of the family synod will be released. Cardinal Nichols is representing the Church of England and Wales at the synod, which runs until 25 October, and is joined by the Bishop of Northampton, Peter Doyle, who is in charge of the bishops’ conference marriage and family life department. He stressed that he and Bishop Doyle will bring to the synod the feedback received from Catholics in England and Wales, many of which has called for a shift in the Church’s approach to divorced and remarried and gays. “This is not a meeting of male celibates, this is a meeting of shepherds appointed by Christ to care for his people. And we try to bring everything that we’ve heard into this synod,” he said. The process for the coming synod will include more time for small groups - the circoli minori - and speeches from participants limited to three minutes. Cardinal Nichols, who has attended a number of synods in the past, said the process will avoid the current synod being simply a “re-run” of last year and include a greater voice for married people and lay women. “In every group there will be people who are married and therefore there’ll be women, and it’s much easier for those voices to be heard in small groups then it is in the aula [the synod hall],” he said. “In the small groups you engage with each other. And I think it will be vigorous and I think it will be creative as well. On the question of divorced and remarried catholics he said “there will be no categorical answer” on whether they can receive communion. Pope Francis, the cardinal explained, wants the synod not to see the family as a problem and seek to find solutions but see where its struggles are and how to offer support. As an example Cardinal Nichols re-iterated his criticism of the government’s policy of refusing to allow the non-EU partner of a British citizen to come and live in the country.